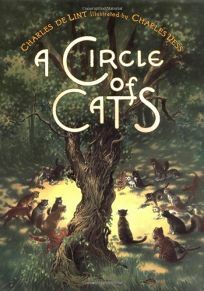 Charles de Lint and Charles Vess team up for the second time in A Circle of Cats, the prequel to the novella Seven Wild Sisters. Free-spirited orphan Lillian roams the wild woods until a poisonous snake bites her. To save her life, the cats turn her into a kitten. How the Apple Tree Man and the panther help her become a girl again is a fantastic tale indeed.